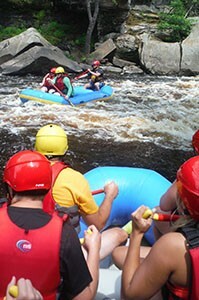 White water rafting on the “Clean and Beautiful” Kettle River. Are you looking for adventure ?? How about whitewater rafting near Minneapolis ? 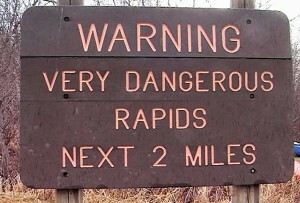 The Hard Water Sports whitewater rafting tours leave from the small town of Sandstone, Minnesota. Located half way between Minneapolis and Duluth. The Kettle River is a designated “Scenic and Wild” river trail. River tours with Hard Water Sports take paddlers deep into Banning State Park. Your Kettle River adventure includes running the Hell’s Gate Rapid. It’s the last big drop on the tour and one of the most beautiful places in Minnesota. Tours leave from the Hard Water Sports guide shop in Sandstone Minnesota. 511 Main Street – across from the post office. An hour north of the Minneapolis Saint Paul Metro, Sandstone Minnesota is located just off interstate 35.